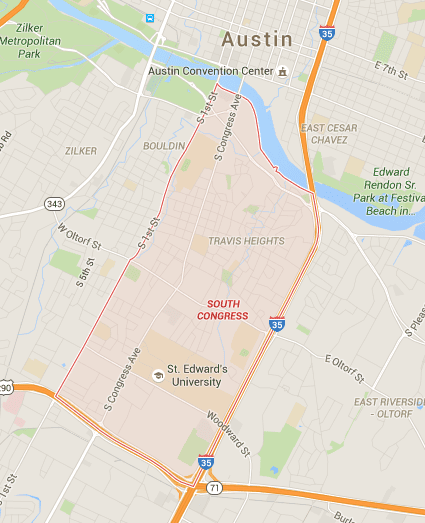 Across from Lady Bird Lake along South Congress you’ll find the famous SoCo neighborhood of Austin. On the borders of the historic Travis Heights neighborhood to it’s east, and Bouldin Creek to the west, it’s a great area loaded with eclectic places to shop, dine, exercise, and be entertained or enriched one way or another. Before the recent rise of East Austin’s hipster status, SoCo was where it was at. However, as time rolls on, the SoCo neighborhood has become home to more young families and business people. Since the 1970’s, SoCo has been a mecca for artists and musicians, and by the 1980’s, many of the shops you’ll find there today began popping up in the area. With a perfect head-on view of the state capitol from South Congress Avenue, SoCo is where you can park and walk to just about everything in the area. It’s a perfect neighborhood for young Austinites looking for a hip area that want to live close to the “weirdness” that Austin is famous for.